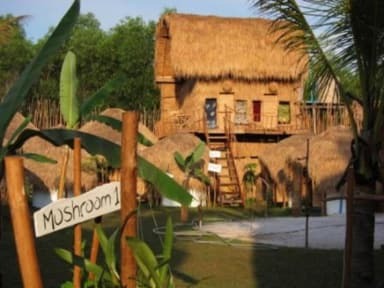 Mushroom Point i Sihanoukville, Cambodja: Reservér nu! 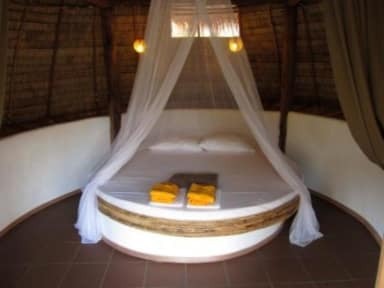 Located in Otres, 1.5 km far from Sihanoukville, MUSHROOM POINT & BEACH features free WiFi access and parking. MUSHROOM BEACH is situated directly on the sandy beach, some of the bungalows have shared bathrooms, there is a very good restaurant and bar, sun beds, massage and WiFi all over the place. MUSHROOM POINT is situated inland, 70m far from the BEACH, the bungalows here are all garden view and have private bathrooms, some of the bungalows have private sitting area as well, a really nice Italian Restaurant opening October 2017 and WiFi access in lobby and bar areas. IMPORTANT: MUSHROOM POINT & BEACH was designed and built by an artist therefore the atmosphere of the reception, bar, rooms and common sitting areas is fantastic, the whole structure is ecologic but this also means that our bungalows are not completely sealed. We don`t have AC or TV. If luxury is what you are looking for maybe this is not the right place. We have tropical trees in the garden, coconut palm trees on the beach, good vibes, friendly staff….